In the new era, China has evolved into a new stage that emphasizes connotation development and improvement of people’s living standard. As one of the core cities of Guangdong-Hong Kong-Macao Greater Bay Area and one of the leading maritime capitals of the world, Shenzhen is currently making every effort to create a national forest city and build a world-famous flower city, and will use the “Year of Urban Quality Improvement” as the norm for its work. We will focus on important contents including optimization of its urban quality and modernized functions, and improving the people’s life as well. As the east extension line of Shennan Boulevard, Shenyan Road is the most important traffic artery and dynamical axis of urban development of Yantian District. 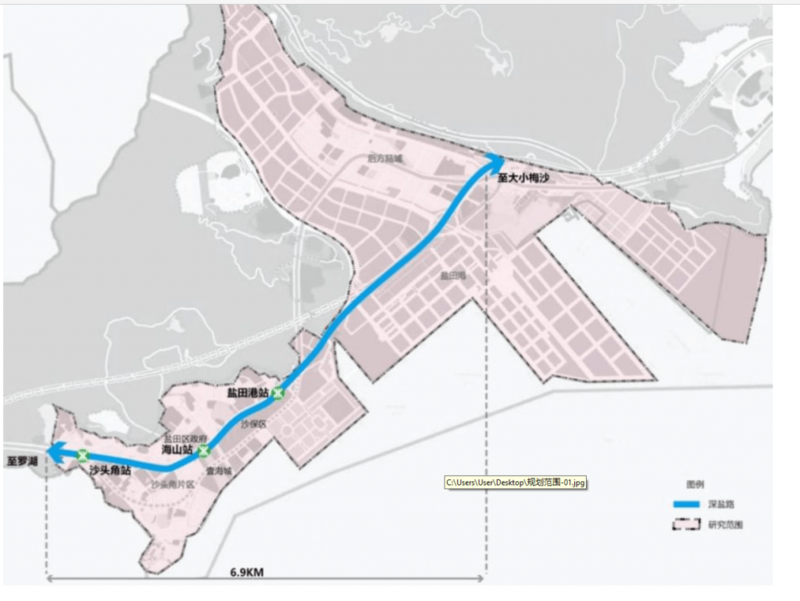 With the opening of the track line 8 and the acceleration of the urban renewal projects along the route, the spatial pattern of urban construction land along the Shenyan Road will undergo significant changes. There is an urgent need to improve urban quality relying on the reconstruction of Shenyan Road. Therefore, Yantian District plans to organize this International Design Competition of Shenyan Road Landscape Improvement Project, introduce an international first-class design team, and transform the Shenyan Road into a model for projects on road quality improvement. Shenyan Road is the development backbone of Yantian District, the road experiencing from flourishing city to coastal style, and an important landscape and hospitality avenue to Yantian, which directly represents the city image of Shenzhen and Yantian. Meanwhile, Shenyan Road is the endogenetic dynamical axis of urban development of Yantian District, and leads the district’s overall spatial expansion. Through holding this international competition, it’s aimed to attract domestic and foreign first-class design teams, improve urban image of Yantian with international vision and the latest ideas, connect the mountain and ocean landscape corridors, highlight urban characteristics integrating mountain view, urban landscape and seascape, and build Shenyan Road into a classic model of urban quality improvement. Overall research scope of this International Competition for Sheyan Road stretches from the portal of Wutong Mountain Tunnel in the west to Beishan Overpass in the east, with a total length of 6.9km. It includes public spaces, parks and nodes, etc., related to the overall space, function and image of Shenyan Road. 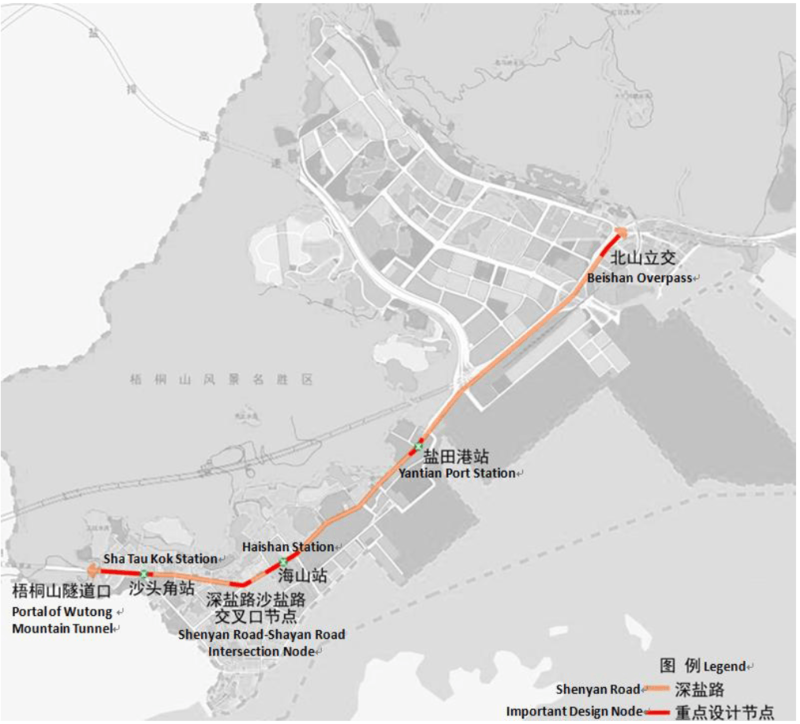 Important design nodes include Sha Tau Kok Station (including the portal of Wutong Mountain Tunnel), intersection between Shenyan Road and Shayan Road, Haishan Station (including the district government area), Yantian Port Station, Beishan Overpass and other nodes deemed as necessary by design firms. The candidates shall carry out deep analysis on various factors (land utilization, road traffic, landscape, environment, climate, humanistic and cultural resources, etc.) of Sha Tau Kok Sub-district, Haishan Sub-district and Yantian Sub-district, find the characteristics and identify the problems. They need to put forward overall design principles, design ideas and design objectives for Shenyan Road based on analysis of current situation, oriented by problems-solving and complementarily directed by the objectives. The candidates shall lay emphasis on the design of surrounding areas and crossing facilities for Sha Tau Kok Station (including the portal of Wutong Mountain Tunnel), intersection between Shenyan Road and Shayan Road, Haishan Station (including the district government area), Yantian Port Station and Beishan Overpass. It includes but is not limited to suggestion on traffic optimization, slow traffic system design, crossing facilities design, road greening design, street furniture design, and design of lighting night scene, etc. In order to highlight the open, scientific and practical nature of design, open competition will be adopted. Winning design schemes will be selected through competition, which is scheduled to be completed by the end of June 2018. This International Competition is open to registration. The jury panel of prequalification will carry out preliminary review on the registration documents submitted by design firms, and select six design firms to issue the Invitation to Formulate the Design Scheme (at the same time, two alternatives will be selected; in case any invited firm quits, they can take its place in order). Rich planning and design experience in urban slow traffic system. Designers participating in this International Competition must be registered personnel of the firm. The chief designer should be those that have presided over many similar planning & design projects, and must be involved in the whole design process in person. To ensure that the project designers of foreign design firms have a correct understanding of the background of China and relevant requirements, at least one project designer with proficient Chinese language skills shall be included. This International Competition is open to those design firms and design consortiums that meet the aforesaid requirements, while personal registration is not accepted. Before 17:00, April 23, 2019 (Beijing Time; the time when the Consultant receives the hardcopies of registration documents shall prevail). Applicants might send the registration documents to the organizers by email. With confirmation, applicants then shall deliver the complete registration documents to the Consultant by a designated person or by post. The registration documents shall be sealed in an opaque package whose cover shall be marked as “Registration Documents for the International Design Competition of Shenyan Road Landscape Improvement Project” and name of the applicant.